DC Comics' greatest covers reproduced in metal! Every cover in the collection has been carefully chosen from the DC Comics library. The original artwork files are supplied by DC Comics then the artists at Eaglemoss pick out the details that will be emphasized, taking care to make the cover as dramatic as possible. The artwork is then printed on tin and embossed, ready for you to display or collect. 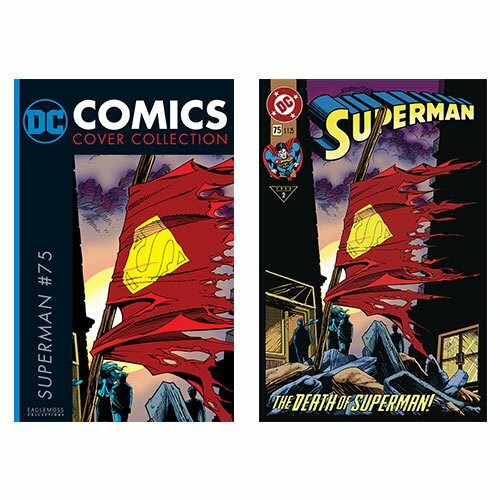 The DC Comics Superman V2 #75 Tin Cover Collection #2 features the art of Dan Jurgens and Brett Breeding in the iconic Death of Superman storyline.